The Shockley diode calculator allows you to calculate either the voltage drop or the current flowing through a real diode, knowing the other value. It allows for I-V values to be calculated and helps you understand how the transistor works in either forward or reverse bias. The Shockley diode calculator can obtain values for both a real (imperfect) and an ideal diode using the Shockley diode equation (also called the diode law). Put simply, a diode is an electronic component that only allows the electrical current to flow in one direction. It is made by putting in contact an n-type and a p-type semiconductor crystal. The physics behind the behavior of the p-n junction are complicated but the resulting diode can almost perfectly block the current flowing in one direction of the electrical circuit while allowing it to flow normally on the other. The Shockley diode calculator helps you calculate the current-voltage (I-V) relationship in both cases. As it is common in science, there are imperfections arising from the manufacturing processes and the imperfect technology at our disposal; these imperfections are parametrized by the emission coefficient (n) that ranges typically between 1 and 2 (1 being an ideal diode). The ideal diode is, as the name implies, an idealization in which the diode is assumed to have no imperfections. In most cases, a real diode can be assumed to behave like an ideal diode without a big loss in accuracy, but for very precise calculations the user is welcome to change the emission coefficient from that of an ideal diode (1) to that of the diode they are working with. This emission coefficient is a parameter of the diode and should be given as part of its specifications. The Shockley diode calculator uses the Shockley diode equation (shown below) that has 5 different parameters, 4 of which should be input by the user. n Emission coefficient, is a parametrization of the imperfections of the diode. Typically ranges from 1 (ideal diode) to 2. It is set to 1 by default in the Shockley diode calculator. Is (Reverse) Saturation current is the intrinsic current present in all diodes (including the ideal diode) and it is almost only dependent on the temperature. For more detailed explanation we recommend the Wikipedia article on reverse saturation current. Vt Thermal voltage is the internal voltage in the diode when disconnected from the circuit. It is caused by the temperature and the properties of the p-n junction inside of the diode. The other 2 are experimental variables, the ones that are typically changed during a laboratory experiment. Vd Voltage drop is the voltage difference between the connections of the diode to the circuit. I Current flowing through the diode. 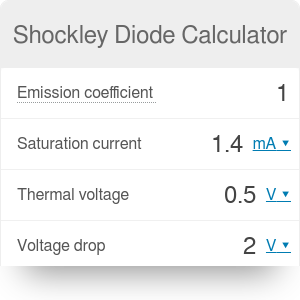 The Shockley diode calculator is a simple tool that allows you to obtain information about a real/ideal diode. The typical use case would be to obtain the I-V curve of a particular diode from its specifications but when used in conjunction with other calculators, the possibilities increase greatly. For example, by using this Shockley diode calculator in conjunction with the Ohm's law calculator, you can obtain the values of the resistance and power draw of the real/ideal diode for any value of current or voltage. This is especially useful since a diode does not follow a linear relationship between the current flowing through it and the voltage drop, because its resistance is not constant but dependent on the voltage/current applied and the temperature. Other uses might include fast simulation of simple circuits and their properties. It is true that as an electrical circuit to be simulated grows in complexity, it becomes more time efficient to use dedicated software (such as LabView, LTspice...) for such a task. Nevertheless, in the case of one-time simulations of basic circuits, this Shockley diode calculator - together with the LED resistor calculator and the voltage drop calculator - provides a straightforward way to perform accurate simulations of circuits involving diodes (including several LEDs) and to take into account the effects of the wiring/resistances present in them. Shockley Diode Calculator can be embedded on your website to enrich the content you wrote and make it easier for your visitors to understand your message.